The blunt force trauma, rapid de-acceleration, and forward momentum associated with an auto accident can easily result in broken bones for drivers and passengers alike. Lane departure, rear-end, and head-on collisions are the most likely to lead to broken bones, but this type of injury can be associated with almost any auto accident. If you have suffered a broken bone in an accident caused by another driver’s negligence, you are entitled to personal injury compensation. Broken bones can cause intense pain, bruising, swelling, limited range of motion, and misshapen or out of place joints. In most cases, an X-ray is all that is needed to diagnose the break. X-rays allow doctors to pinpoint the location of a fracture, assess the severity of the break, and check to see if there is any injury to adjacent joints. However, a computerized tomography (CT) scan or magnetic resonance imaging (MRI) can also be recommended if the X-ray does not clearly show the extent of the injury. Most broken bones are treated with immobilization in a plaster or fiberglass cast to keep the bone in the correct position so it can heal properly. With a more minor injury, doctors can sometimes use a functional cast or brace so the patient can still have limited movement of nearby joints. The majority of people who experience broken bones from a car accident will not require surgery. However, there are two main types of surgical intervention that can be used. External fixation uses metal screws or pins placed into a broken bone and connected to a stabilization bar outside the skin, while internal fixation repositions the bone into the correct alignment and holds fragments together with rods, screws, or metal plates inserted through the marrow space in the center of the bone. Bones have an impressive capacity to heal, but it is important to be patient during your recovery. 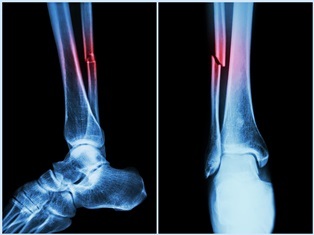 Fractures typically take anywhere from three weeks to six months to fully heal, depending upon the type and location. To speed up your healing time, it is important to follow your doctor's treatment recommendations precisely. Keep all necessary appointments and remember to perform any recommended exercises at home to help restore muscle strength, flexibility, and joint function. Don't rush back into your daily routine before your doctor says it is safe. Fractures stop being painful before they are fully healed, so you cannot rely on pain to tell you whether an activity is causing further injury. You have two years to file a personal injury claim for damages related to your auto accident, but it is best to begin the process as soon as possible. Evidence becomes harder to locate as time passes. Inland Empire Law Group’s legal team is committed to helping California residents receive the personal injury compensation they need to move forward with their lives following a car accident. Please contact us today at (888) 694-3529 to schedule a free, no-obligation consultation at either our Rancho Cucamonga or Victorville locations.